Having Fergus send emails from your work or personal email account is a great way to ensure emails reach your recipient's inbox and avoid going to spam. Note that only Master Admin Users can see these settings. It's usually easiest to grab these settings from the person who set up your work email. If you'd like to give it a go, head to the link for your email provider below or search Google for "[my email provider] SMTP settings". Replace [my email provider] with the name of the service you use to send emails. Start by entering your username. This is the email address you want Fergus emails to come from. Password is the password you use to login to the email address you put in the Username field. Host, Port, and SSL/TLS is set based on the info in the links above. 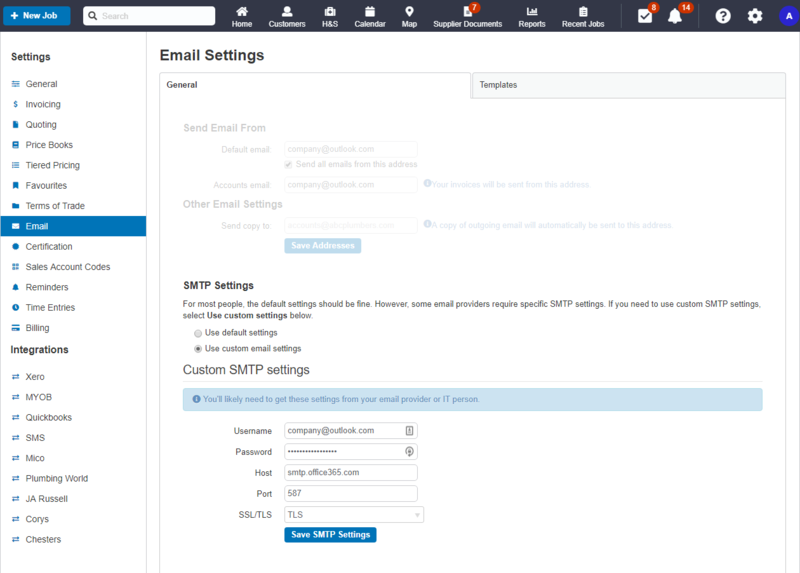 Finally, hit Save SMTP Settings and we'll send you a brief email to test everything is correct. Before contacting Fergus Support, have a word with the person who setup your work email and give them the error message. Your IT person may need to whitelist our IP. If so, they can use this IP address: 52.62.15.193.